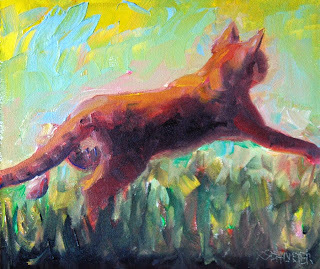 ARTWORK by RK Schlueter: "Spring"
oil on6"x7" panel. "Spring" is a painting of celebration of sunnier days. I used a photo of a kitty I met in Weaverville CA... I see lots of cats in my travels and if I have my camera I will take as many shots as I can, to use for my paintings.